The Green Bay Packers visit the Carolina Panthers in Week 15 of the 2017 NFL season. PFF previews the top player matchups of the game. 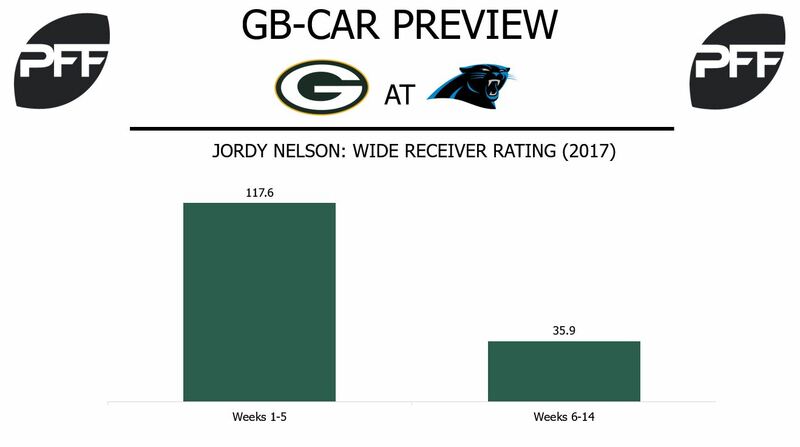 WR Jordy Nelson vs. CB James Bradberry – Nelson will look to return to his early-season form with quarterback Aaron Rodgers back at the helm. When Rodgers was healthy through the first five games of the season, Nelson possessed a wide receiver rating of 117.6 while averaging 1.46 receiving yards per route run. In the eight games since then without Rodgers, he’s registered a 35.9 wide receiver rating and has averaged 0.76 receiving yards per route run. Bradberry’s coverage grade of 45.1 ranks 100th out of 118 qualified cornerbacks. He’s allowed 1.35 receiving yards per coverage snap and a passer rating of 85.3. G Lane Taylor vs. DI Kawann Short – Taylor possesses a pass-blocking grade of 72.8 and a run-blocking grade of 49.1. He’s allowed a team-high 24 total pressures. Short’s overall grade of 90.2 ranks sixth among interior defenders. His 10.4 run-stop percentage is tied for 10th in the group, while his pass-rushing productivity of 8.5 is tied for eighth. RB Jamaal Williams vs. LB Luke Kuechly – Since Week 10, Williams has posted an elusive rating of 37.4 while averaging 2.48 yards after contact per rushing attempt. He’s also made an impact in the passing game, ranking fourth among running backs during that span with 2.05 receiving yards per route. He owns an overall grade of 74.5. Kuechly ranks second among linebackers with an overall grade of 94.6. His run-stop percentage of 10.4 ranks fifth, while his average of 0.77 receiving yards allowed per coverage snap is tied for the fourth-lowest rate. WR Devin Funchess vs. CB Damarious Randall – The Panthers most reliable receiver has seen his production slow a bit as of recently, his catch rate of 51.9 percent the last three weeks is second-lowest among wide receivers with at least 25 targets. But the tough matchups against Marshon Lattimore and Xavier Rhodes the past two weeks would make any receiver work hard for his receptions. Funchess’ biggest struggles have come via the deep ball (20-plus yards downfield), where he’s been targeted 19 times but has been only able to haul in three of them for receptions. Randall on the other hand has been one of the stingiest corners deep, allowing a passer rating of 13.3 on those passes. In the past three weeks, Randall has only allowed a passer rating of 33.3 on any passes thrown his way, which is the fifth-lowest mark in the league. RB Jonathan Stewart vs. DI Kenny Clark – The veteran Stewart is coming off his second 100-yard rushing game of the season and his three rushing touchdowns equaled his season total coming into Week 14. But Stewart had a lot of help from his blocking, with only 23 of his 103 yards coming after contact. He forced zero missed tackles for the second-straight week. His 2.26 yards after contact per attempt this season ranks 43rd out of 51 running backs. Stewart’s ability to run through contact will be tested even more this week against one of the best run defenders in the league in Clark. His 89.1 run-defense grade and 24 run stops both are eighth-highest among interior defenders. TE Greg Olsen vs. LB Blake Martinez – Since Olsen’s return from injury two weeks ago, Panthers tight ends have accounted for only 11.5 percent of Cam Newton’s targets. 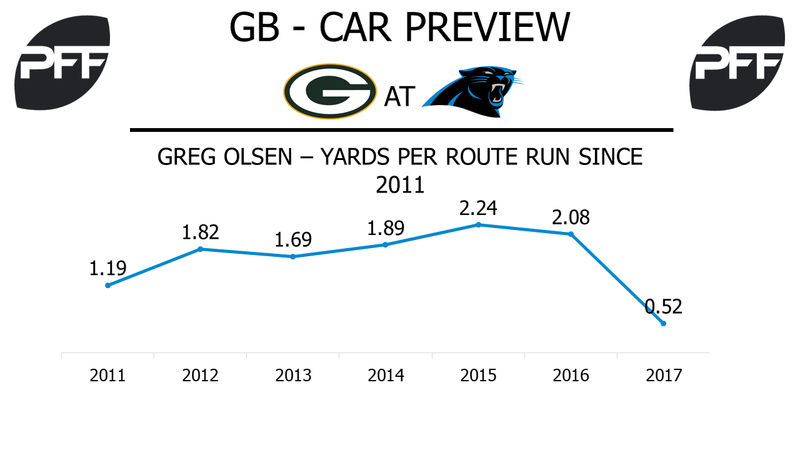 Olsen only has 0.36 yards per route run in that span, the third-lowest in the league, and his 0.52 yards per route run for the season is on pace for the lowest of his career by over half a yard. Over half of his snaps played this season (52 percent) have been run blocking, if that continues it’ll be the first time in his career that over half of his snaps have been in the running game. Martinez leads the Packers’ defense in snaps covering a tight end and he has allowed a passer rating of 120.2 to the position. His 49.2 coverage grade is the 47th-highest among linebackers this season.